SEIK cable supports are used in double format. This helps the pulley cradle to run smoothly and also the suspension cable wears less. The supports can carry loads of up to 85 ton (17 ton with twin double format). 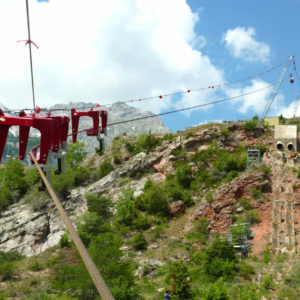 The diameter of the suspension cable can vary from 22 to 44 mm. The double cable support with a weight of 100 kg can be split into 5 parts. Distorsion occurs at 35 ton. A roller can be fitted beneath the truckline to guide the main line and to prevent it from demage. By means of this guideroller the supporting mast are less stressed with wide kink angles and work beneath the cable can be ahead safely and unhindered.